Beautiful Roma Leathers concealment purse made from Premium cowhide leather with reinforced stitching and quality zippers. Width: 13 inches, Height: 11 inches, Depth: 5 inches. The Gun Compartment pouch includes two YKK lockable zippers (7 1/2 inches) for ambidextrous side access (4 keys included). The compartment measures 7 1/2 inches x 10 inches and is velcro lined for precise gun positioning.The zipper on top opens to a spacious center compartment with a divider. Multiple pockets inside including two zippered compartments. Multiple pockets on sides of purse for extra storage. 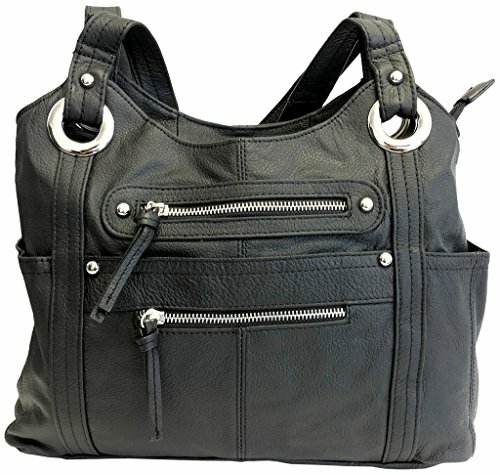 Shoulder strap wrapped around strong silver grommets for a stylish look. Size: 13 in. X 11 in. X 5 in. View More In Top-Handle Bags. If you have any questions about this product by Roma Leathers, contact us by completing and submitting the form below. If you are looking for a specif part number, please include it with your message.